Police have busted an Ontario “super labs” and seized $5 million worth of drugs in the biggest meth haul the force has ever seen. York regional police’s organized crime bureau executed six search warrants across the region after receiving a tip about suspicious material dumped at sites north of Toronto. “We would categorize both of these production locations as a super lab,” Det. Sgt. Doug Bedford said. “They were able to produce multi-kilo level of synthetic drugs, way beyond the type of lab for personal use, this is a drug factory. The force said four men and four women are facing charges including production of a controlled substance, possession of the proceeds of crime and possession of methamphetamine for the purpose of trafficking. A warrant has been issued for an outstanding suspect on charges that include production of a controlled substance, money laundering and four counts of mischief over $5,000. That suspect is believed to be in Vietnam. Twelve vehicles as well as Canadian and U.S. cash were also seized in the raids. “York regional police continues to investigate clandestine drug laboratories and combat the organized crime groups that run them,” YRP wrote in a press release. York regional police said someone spotted more than 100 garbage bags and plastic canisters dumped on a driveway in East Gwillimbury, Ont., in November. A similar dump site was reported to police on Dec. 2. Those discoveries eventually led officers to a dormant drug lab in East Gwillimbury and an active one in Innisfil, Ont. They said officers discovered that the contents of the bags were byproducts of synthetic drug manufacturing. The investigation led officers to a gang and the location of the two suspected meth labs. 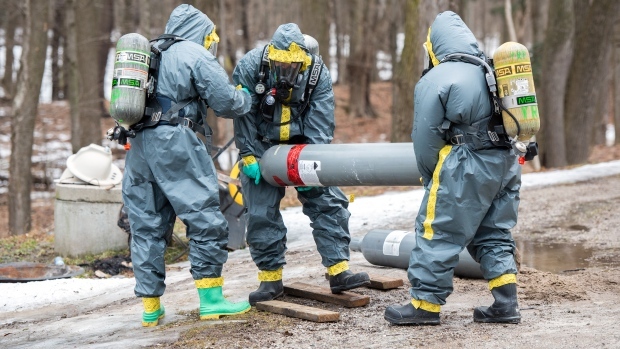 Over the course of the investigation, dubbed Project Discard, officers seized more than 21,000 kg of toxic waste and 50 kg of methamphetamine, Bedford said. It’s possible that some of the drugs were ending up in the local community, he said, but it’s likely that most of them were being shipped to larger markets given the quantity being produced. “The sheer scale of these labs and what they could have produced or may have produced leads me to believe that there’s a larger network of trafficking and distribution, with — no doubt in my mind — exportation to possibly other countries,” Bedford said, noting that regardless of where they end up, it’s important to cut drugs off at the source. Officers began to execute search warrants across the Greater Toronto Area on March 14. York regional police is asking anyone who finds dumped garbage that smells of chemicals or appears to be dangerous to contact them. “I want the community to feel safe that we’ve dismantled this organized crime group and removed a large quantity of drugs from our streets,” he said. Related Stories GPS mishap leads driver with 4. The inside of a meth lab raided by York Regional Police in East Gwillimbury, Ont. Barrels of chemicals found in a meth lab in East Gwillimbury, Ont., by York Regional Police. (York Regional Police handout).